Like GABF week? Then you're gonna love Durango Beer Week. It's the latest collaboration between a consortium of the four Durango area breweries: Carver Brewing, Durango Brewing Company, Ska Brewing and Steamworks Brewing Company. It's happening between September 16th and the 24th. It's the first annual Durango Beer Week and your invited. It'll be a week filled with special events, dinners, anniversary parties, Oktoberfest, food, music and much more. Read the press release below for all the details of this upcoming event. DURANGO, Colo. – Beer, beer everywhere, and plenty of it to drink. The Bootlegger’s Society, the local consortium of Durango’s four award-winning craft brewers, launches the inaugural Durango Beer Week. Festivities, which include Durango’s official Oktoberfest, are set for Friday, Sept. 16 through Saturday, Sept. 24, 2011. 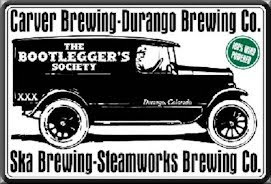 Ska Brewing Co., Steamworks Brewing Co., Carver Brewing Co. and Durango Brewing Co. originally came together as the Bootlegger’s Society in 2003 with a mission to raise the awareness and understanding of craft beer by rallying around the needs of the community. The Bootlegger’s Society is a qualified not-for-profit under the Community Foundation of Southwest Colorado. "Durango continues to be the Napa Valley of craft beer,” said Dave Thibodeau, Ska Brewing co-founder. “With Steamworks and Ska both celebrating anniversaries this September, and with the Bootleggers now organizing Oktoberfest, we decided to go all out. Durango loves its craft beer." The week officially kicks off with Steamworks’ 15th Anniversary Beer Dinner, to be held on the brewpub’s back deck, Sept. 16, 7 p.m. Celebrating Steamworks as a “gastropub,” Chef Sean Clark will offer a five-course meal matched to the artisan brews of Brewmaster Ken Martin. Cost is $40 per person, and reservations are available by calling 970.259.9200. Durango’s official annual Oktoberfest is set for Saturday, Sept. 17, 11 a.m. to 4 p.m. on Main Avenue between 9th and 10th Streets. Proceeds from the event will benefit the Women’s Resource Center. Food vendors, children’s activities and live music throughout the day from the Alpiners, Midnight Backhand and Moreland & Arbuckle are also planned. Durango Herald Arts & Entertainment Editor (and beer aficionado) Ted Holteen will serve as master of ceremonies. For further information on Durango Beer Week, visit www.realbeer.com. • Friday, Sept. 16 Steamworks’ 15th Anniversary Beer Dinner, 7 p.m.
Five gourmet cuisine courses from Chef Sean Clark and beer from Brewmaster Ken Martin, $40 per person, limited to 50 guests. • Saturday, Sept. 17 Oktoberfest, 11 a.m. – 4 p.m., Main Ave.
• Monday, Sept. 19 Beer Brunch at Carver Brewing Co., 11 a.m. – 2 p.m.
• Tuesday, Sept. 20 Lady Falconburgh’s Beer Bingo, 9 p.m.
• Wednesday, Sept. 21 Durango Brewing Company Brewathalon, 5 p.m.